Famous for their inspiring, quit-the-rat-race-and-do-what-you-love books, Bob and Melinda Blanchard are two of the warmest, sweetest, most caring people. Their restaurant, run with love and passion, Blanchards, blends a charming and high-end atmosphere, creating a unique feeling. 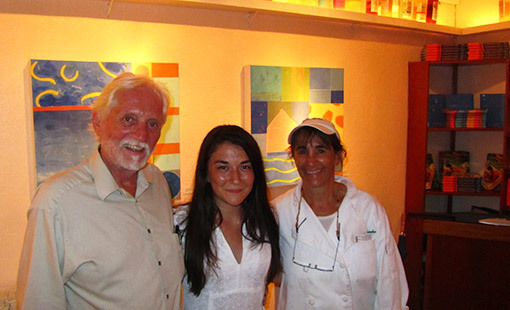 With terrific service and creative cuisine, it's one of the island's best. "You're the reason we ever came to Anguilla, even found Anguilla!," You hear guest upon guest gush to Bob Blanchard, co-author of A Trip to the Beach. Bob and Melinda are people of impact. We could have never known at the time, but they set our lives on a new path back in 2002 when my Dad first picked up their book. 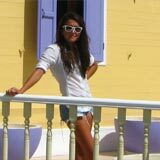 He fell in love with their story, and Anguilla. Originally from Vermont and New York City (respectively), Bob and Melinda ditched the "rat race" and moved to Anguilla to pursue new dreams, different dreams. In their nationally-recognized book, Bob and Melinda tell the story of how they came to own and operate one of Anguilla's finest restaurants. 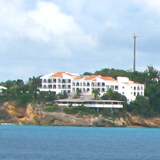 Upon our first visit to Anguilla, our family's hearts fell captive to the island. 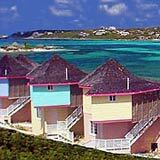 We followed that feeling, and moved to Anguilla (selling everything in Canada) in 2008. Without their story, would ours exist? 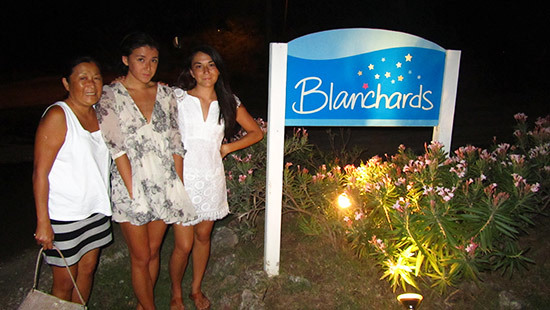 Blanchards exudes a certain classic Caribbean charm that puts you at ease. Maybe it's the painted wooden shutters. Maybe it's the wooden fixtures and the glowing lights. A soft and easy feeling is complemented by uplifting artwork inspired by many landscapes. In A Trip to the Beach, Melinda and Bob wrote about their intentions for the restaurant. Something that made people feel "at home" was their aim. The Blanchards have accomplished just that. The restaurant is without a doubt high end and upscale, but without imposing airs or feelings of intimidation or expectation. Insider Tip: Reserve the table on the porch that is closest to the sea, in the far left-corner. Tucked away, it feels significantly more private and intimate, with a pretty view of the well-kept gardens, the ocean in the near distance. The setting is simply picturesque. We were kindly brought to our table and given the menus. The staff is so attentive and friendly. Of course, if you have the read books, you will recognize the staff. My Dad asked for Lowell Hodge immediately upon our arrival! He has been with Bob and Melinda since the restaurant opened in 1994 and was mentioned over and over in their book. Rum punches, white wine and sparkling water coming up! We stuck with cocktails and wine by the glass, but many rave over Blanchards well varied and sophisticated wine list. As we looked over the dinner menu, a basket of fresh-baked rolls was placed on our table. Along with it, an unexpected, yet certainly welcomed and ultimately devoured, dish of homemade hummus. This evening we were trying their Prix Fixe Menu. Considering Blanchards' prices for individual items on their menu, the Prix Fixe is a high-value deal. For $48/person you have a choice of appetizer of spring rolls, mixed salad, corn chowder and lobster/shrimp cakes. For a main course you have the option of Mahi Mahi, chicken scaloppine and beef tenderloin. Dessert includes key lime pie, variety of ice creams and cracked coconut ice cream. Melinda's specialty is taking classic dishes, familiar favorites, and spinning them into one-of-a-kind meals that leave you pining for more. The appetizers made for a particularly difficult choice. The North-Eastern favorites caught our eye. Seeing the words "chowder," and then "lobster" in close proximity to "cakes" makes our mouths water. A learned association from our many trips to the Cape. So, my Dad ordered the lobster and shrimp cakes. Dipped in a tomato tartar sauce, they were unforgettable. My Mom was lured in by the vegetable spring rolls, which are served with a soy sauce and a peanut sauce. Yuki and I stuck with mixed salads for appetizers. Next time we will go non-Prix Fixe just to try the roasted mussels. After that evening's meal, we heard that they are the most talked about starter on the menu, served in a broth of coconut milk, ginger and garlic. The first course sure set a strong precedent for the evening! As Melinda and her team of chefs were preparing those very meals in a bustling kitchen, Bob was on the floor. He greets each guest individually, ensuring everyone's needs are met. He is a genuinely kind, interested, and interesting man. 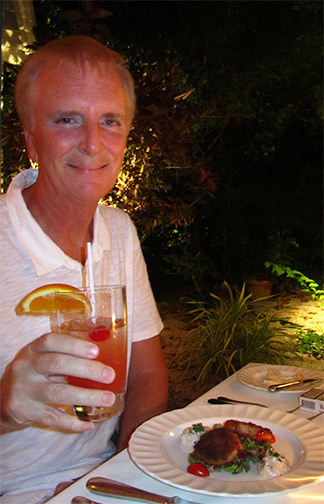 His passion for Anguilla and the restaurant is clear, and so was my Dad's! He was eager to tell Bob about our experiences in Anguilla, how so many of them can be attributed to the Blanchards. Spirited smiles were not restricted to my Dad and Bob that evening. The staff is passionate too, so happy to be where they are, doing what they are doing. We sipped our drinks and soaked in the atmosphere. 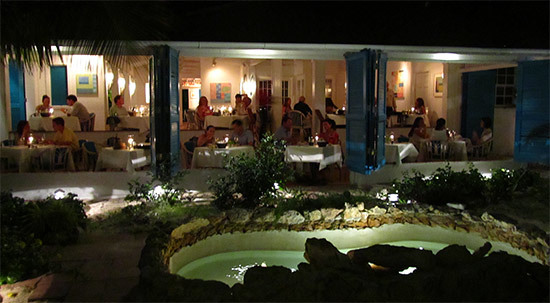 Undoubtedly, Blanchards is one of Anguilla's most famous restaurants, Bob and Melinda, amongst the most famous residents. 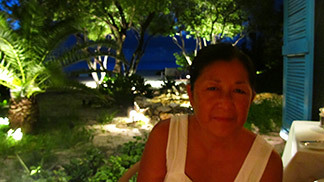 On a quiet summer evening, the restaurant was full, a rarity for Anguilla, as the island quiets right down in the off season. The evening's pacing was well timed. This is one of my favorite aspects to dining in Anguilla. There is no rush with nothing to worry about during dinner, and no where to go after dinner. It is all about unwinding and enjoying. Yuki went with their chicken scaloppine served with mashed potatoes. 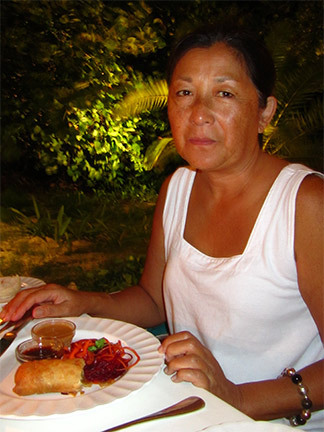 With the perfect blend of citrus flavors, it is one of her favorite meals on the island. My Mom and I ordered the sesame-crusted Mahi Mahi. Soft, succulent, and full of flavor. My Dad's beef tenderloin was grilled to perfection, and served with zesty mashed potatoes of "caramelized onion." The food was simply excellent. Next time we will venture beyond the Prix Fixe Menu, and try menu-favorites. Two of those are the Caribbean sampler and "Mel's Cioppino." The Caribbean sampler includes a taste of their Mahi Mahi, crayfish and jerk chicken. "Mel's Cioppino" is a seafood stew with the highest quality ingredients. Normally, we aren't ones for dessert. 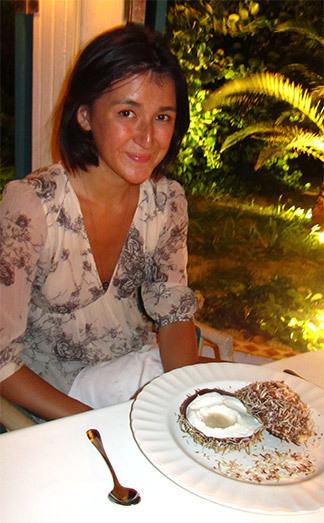 Creamy coconut ice creams lies inside a thick chocolate shell (it even looks like a coconut! ), and is served with Bailey's. It is positively decadent, but not overwhelming. Light and refreshing, it is the perfect Caribbean-night dessert. But, Bob begged to differ! "No, no! 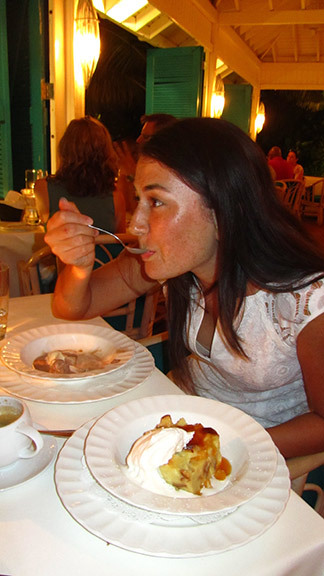 The cracked coconut is great, but my personal favorite, and the real Blanchards' dessert is the warm bread pudding." How could we not try what had just been (in so many words) called Blanchards unofficial dessert? One order of warm bread pudding later, we were sold. Piping hot, it sits in a sweet-and-sour apricot-rum sauce. The whipped cream (real whipped cream) cooled the rich cake in our mouths. With chocolate and vanilla ice cream on the side, it is a good dessert to share. And, in Blanchards' style, it is a classic dish, but infused with Caribbean flavors, it becomes something you can only get here, in Anguilla. Certainly, a staple on the Blanchards menu. It had been a comfortable and relaxing evening. The restaurant glowed inside and out, from the buliding itself to the owners and staff. With exceptional food, Blanchards delivered a flawless evening. 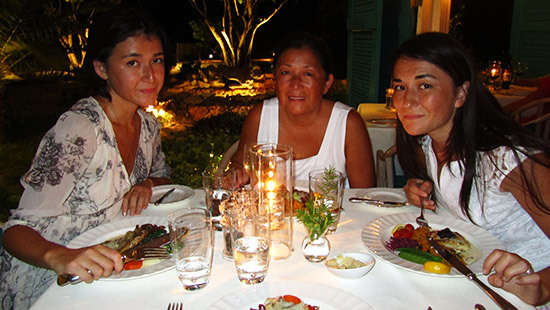 Decades after their opening (in 1994), their enthusiasm for their food, their staff, their service, their guests and Anguilla still shines strong. Before heading home, we were able to thank Melinda personally, just for a quick second. We didn't want to take her away from preparing dishes for too long. We thanked her for a perfect meal, her story and inspiration. Beaming, Melinda has the kind of warmth that stays with you. An unforgettable pair, the Blanchards deliver memorable experiences that last well beyond the dinner table. Directions: Located on the road that runs behind Meads Bay, Blanchards is right next door to Carimar Beach Club. See the map below for exact location. Good for upscale dinner of creative cuisine, thoughtful wine pairings and warm, inviting service. Hours: Dinner only. Closed Sundays and Mondays in the off season. Closed Sundays in the high season.